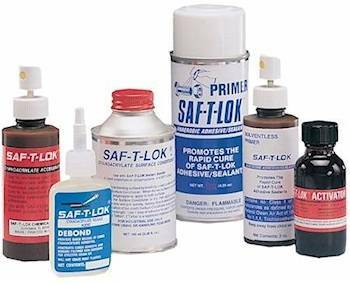 SAF-T-LOK offers a complete line of Primers, Accelerators and Activators to insure ultimate performance from the broad line of SAF-T-LOK® Engineered Adhesives and Sealants. As a partner in "Responsible Care", SAF-T-LOK employees are committed to preserving the environment and include alternative products that are free of all Class 1 ozone depleting components. Primer speeds cure of Anaerobic Adhesives particularly in cold conditions and on less active surfaces such as cadmium. Activators are the second cure component of Structural Adhesives and within a few minutes of assembly parts reach fixture strength. Accelerator speed the cure and increase the gap filling of Instant Bonders. Within a few seconds cure is complete. After an Instant Bonder has been used and removal or repositioning is necessary, immersion for a few minutes in Debond will soften the adhesive and allow removal.